For years now people have been looking carefully at the street plan of Washington DC. There doesn't seem to be any doubt about it - this city was very carefully planned right from the start and it was put together by a bunch of people who were obsessed with sacred mathematics and who were well versed in esoteric subjects. But where did this apparently modern obsession with the street plan of Washington come from? It's hard to know because it seems to have been around right from the start. We know who designed the city, and when. The first plans were laid down by a Frenchman by the name of Pierre Charles L'Enfant in 1791 and the area where the new city would be placed was surveyed by a team consisting of Benjamin and Joseph Ellicot, Isaac Briggs, George Fenwick and Benjamin Banneker. These men were working under the direct instructions of George Washington, the first President of a free United States of America. Washington was a life-long Freemason, and all commentators are sure that this fact had some bearing on the city plan that Washington's fellow Mason L'Enfant, first created. However, a modified version of L'Enfant's plan was eventually used, though still under the direct control of George Washington. Because the city was designed from scratch, it was possible to make it modern and stylish. No old buildings had to be removed and a grid-iron street plan was utilized. It is probably because of this street plan that those believing in a totally Masonic conspiracy have been so active when looking at Washington. In particular they point to a huge pentacle that can be constructed around some of the major landmarks and intersections of the city and they suggest this as being proof of not just a Masonic but also a Satanic element to the United States' first city. But does this pentagram really exist at all? Take a look at the city plan again. 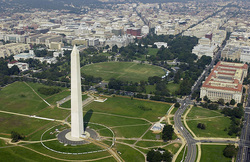 With a grid iron pattern such as the one adopted for Washington DC, it would be possible to make all manner of geometric shapes by joining up intersections and buildings. It isn't even is if the pentagram in question is a 'regular' pentagram. In a regular pentagram all the sides should be the same length. This example is distinctly distorted. But at the same time the idea that there is 'something' unusual about the layout of Washington DC is so compulsive that it must have had its origin somewhere. In fact it does, and we discovered what it was. We truly didn't mean to do so but that's what happened. And it all started thousands of miles away, in Great Britain. So if you want to understand the whole thing you will have to take a journey with us.